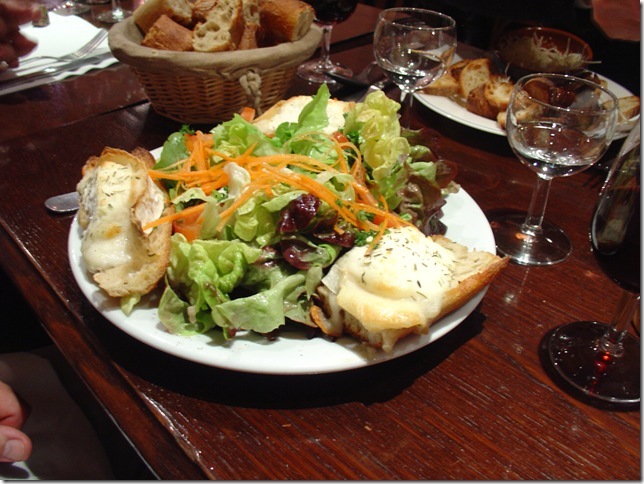 The Experienced Travelers take heart that Parisian dining isn’t all “oh la la” and chi-chi. Casual, affordable meals abound. You just need a knowledgable friend to whisper a coveted address, and your evening will be made. 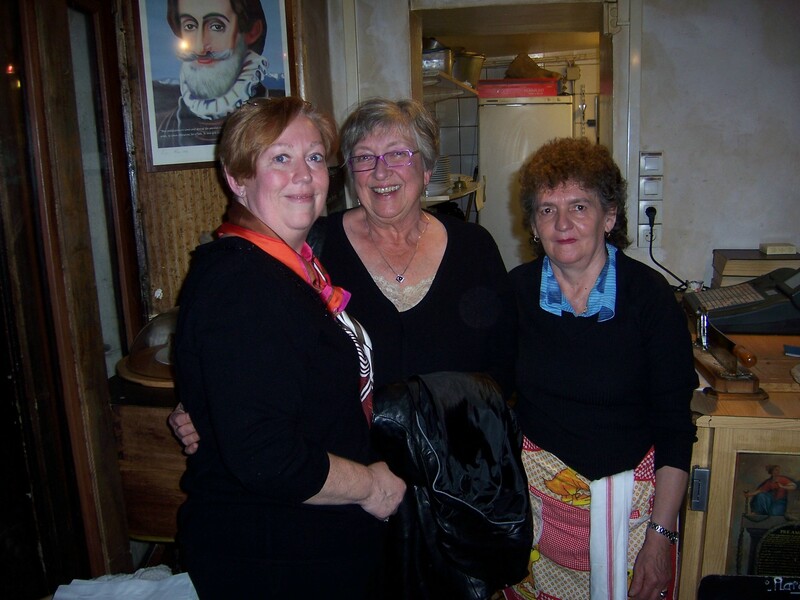 Thanks to a friend of Nurse’s, we got insider access to Le Felteu in the Marais. Two years later, the memory is fresh and we’re still full. Judging from recent online reviews, the secret is out. The ETs were unprepared for what they found; A neighborhood bar and grill serving excellent food under the direction of a French Harley-guy named Jerry. The dining room décor of faded wallpaper and decorative plates was more “early VFW post” than Parisian bistro. But we sensed a happy camaraderie among the banquettes and everything smelled awfully good. In record time, the blackboard arrived listing the day’s menu. 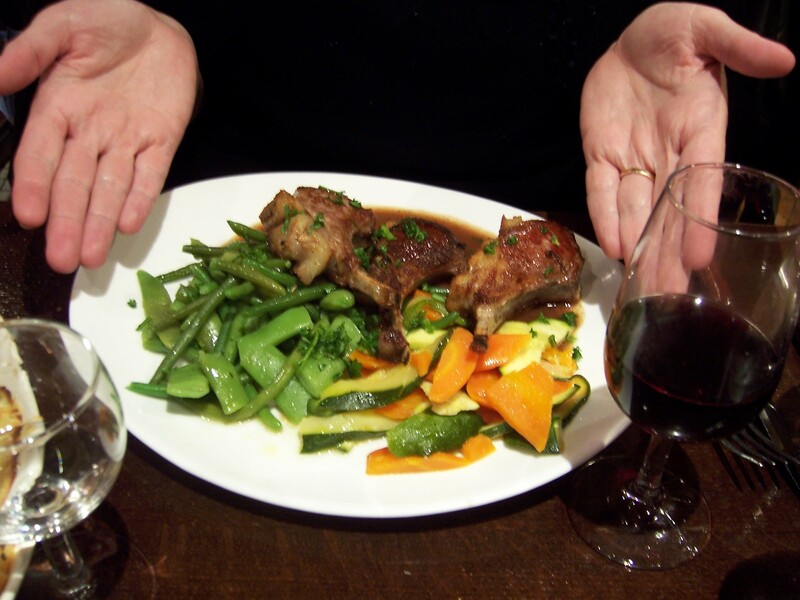 I ordered the house specialty – lamb – and Nurse seized the opportunity to have strange parts and organs in sauce. The dining room buzzed with animated discussion while waiters effortlessly moved between crowded tables with corkscrews, bottles and plates. Le Felteu was looking like a good bet. 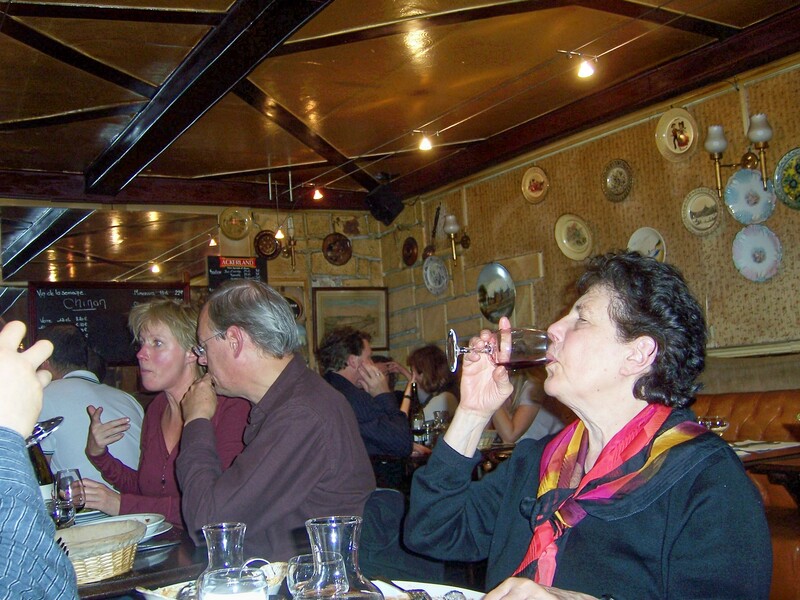 After the heightening effects of the house red wine, we greeted our neighbors – a friendly young man from New Jersey living in Paris, who brought his visiting mother for an authentic meal. Mother insisted she wasn’t going to drink. 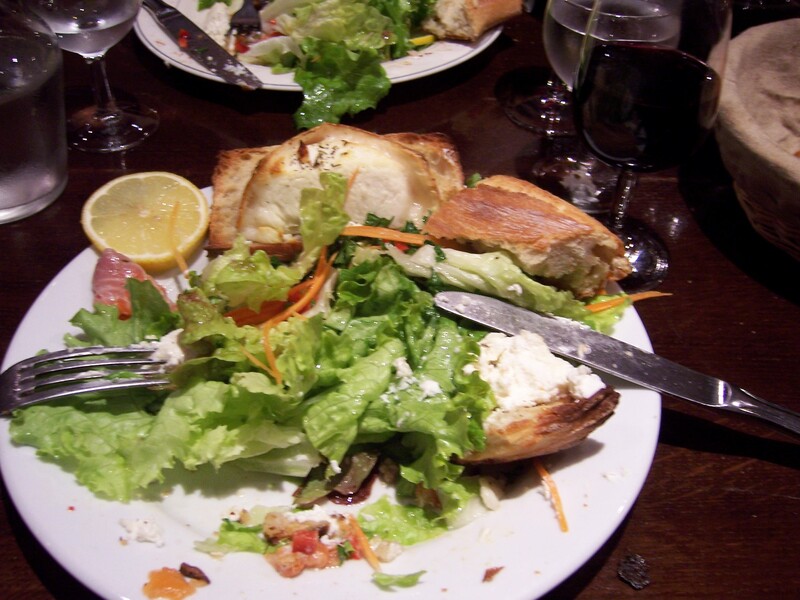 While the ETs speculated about a strange New Jersey code of behavior that forbade French wine, NJ Guy forsook his homeland and ordered a pichet. The ETs glanced around the wine-infused room and quietly bet dessert on how long Mother would last. Over the din we heard a series of repetitive thuds. 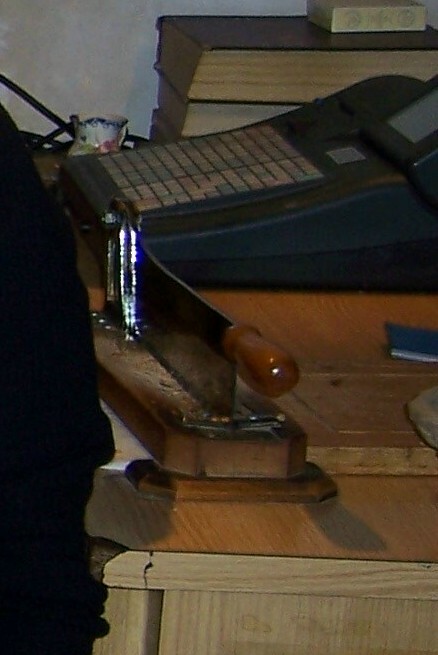 (In France, “chop-chop” can be cause for concern. Fortunately the ETs are solidly middle class.) We turned to watch Jerry’s maman deftly apply a revolutionary-era guillotine to a stack of unlucky baguettes. It was understood that maman would be unquestionably obeyed. While we enjoyed the fruits of maman’s labor, a gargantuan salad with warmed chevre on toasted croutons and a stunning plate of smoked salmon arrived. These were serious man-sized dishes of hearty food. The ETs practice Strategic Eating, but our efforts didn’t dent the portions. The only sensible tactic was to spread the wealth to NJ Guy and Mother. It was then that we noticed her glass of wine, and planned to leave room for dessert. Despite our best efforts, this is as much damage as we could inflict without straying from the Strategic Eating guidelines. We were still dizzy with joy from the entrees when our plats arrived. "How can I possibly eat all this!" My lamb chops were beautiful – and plentiful. Nurse’s large dish of kidneys and vegetables swam in their sauce. 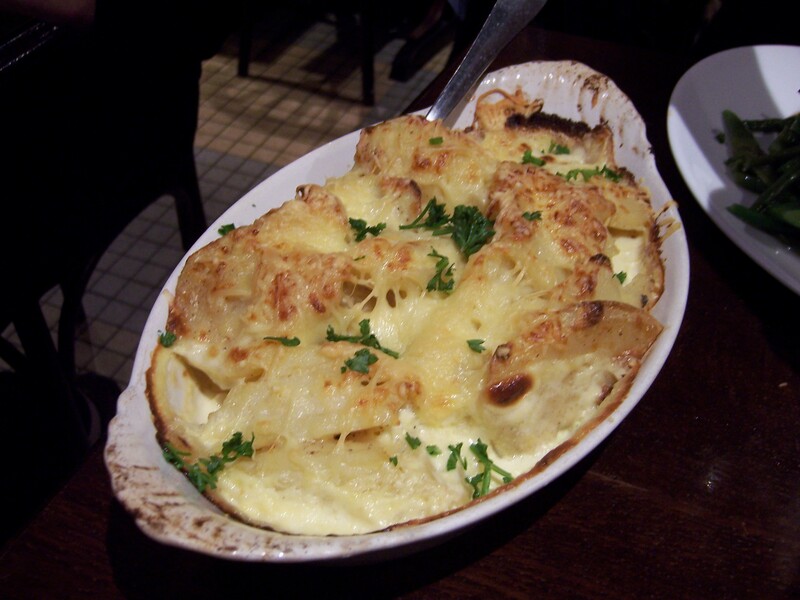 But the coup de grace was an entire casserole of potatoes gratin that was perfectly browned on top and running with rich cheese just below the surface. There are times when only a man will do – and this was one of them. The ETs fed half their dinners to NJ Guy. He got one of my lamb chops, a heaping helping of the potatoes and some of Nurse’s parts. It was gratifying to watch this slender young man devour his meal and ours too. By now, it was clear that the Strategic Eating guidelines ruled out dessert. 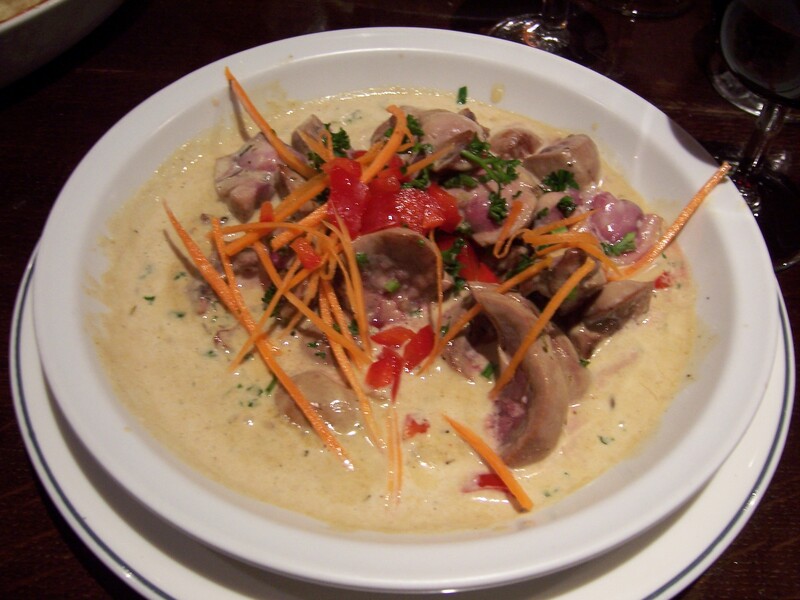 Which was a pity, because the huge bowls of crème broulee that passed our table looked perfect. The miracle of Le Felteu is that we enjoyed this for just €27 each and we wouldn’t need to eat the entire next day, resulting in approximately €85 in Found Money to spend on perfume. And before the evening was over, we got another insider recommendation from NJ Guy who told us that Restaurant Paul Bert served the best steak-frites in town. That, dear Readership, is how it’s done in Paris. Special thanks to http://pannifers.blogspot.com/2008/04/le-felteu.html for letting me use a couple of photos. 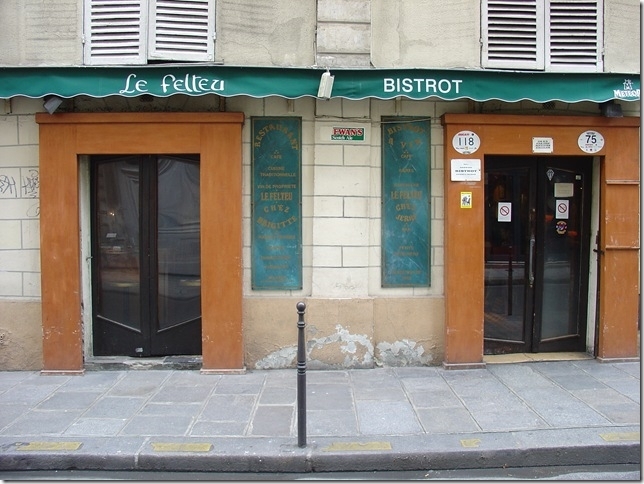 Follow the link to read their review of Le Felteu!